What did you think of The Terminal? Tom Hanks playing a non-English speaking national stuck in an airport? Most people tend to respond, “Yeah, it’s alright. Nothing special but it’s Spielberg and Hanks, isn’t it? 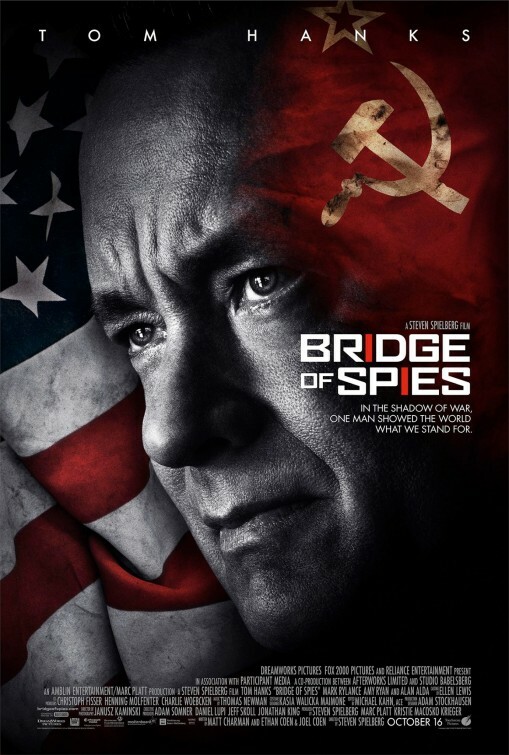 It’s worth a watch.” Bridge Of Spies is essentially that but a little better. The film opens in 1957 to a sting operation as agents in fedoras follow suspected Soviet spy, Rudolf Abel [Rylance] as he goes about his day, picks up instructions from Moscow and sets about deciphering the message. Bursting into his apartment, the CIA agents make their arrest and confiscate the contents of Abel’s hotel room. The country rallies to have the imposter strung up but in the interest of fairness, he is afforded a fair trial and affable insurance lawyer James B. Donovan [Hanks] is assigned to his defence. While he is initially reluctant, Donovan is a good man who believes in the principles of the law and accepts. As the case becomes more public, Donovan and his family are treated poorly by those around him, who see his actions as traitorous. Matters escalate as a US pilot, Francis Gary Powers [Austin Stowell] is gunned down while flying over Russian airspace and Donovan is dispatched to East Germany to negotiate for a prisoner exchange. After the success of Lincoln, Bridge Of Spies is a confident step forward for Spielberg but still lacks the scale and cinematic presence of his golden age work. We tend to take Mr Spielberg and his honed skill for granted but he manages to ensure that the two and a half hour running time doesn’t drag. This is also aided by the Coen Brothers‘ involvement with the script, adding a touch of much needed humour, charm and relatability. The cinematography is fantastic, the production value from the sets to the costumes, props, hair and make-up are all brilliantly immersive and the decision to avoid subtitles entirely was a very nice choice. Thomas Newman’s score has more flare than, say, his work on Mendes’ Bond films but the fit isn’t perfect and seeing Hanks’ face while hearing Newman’s signature lark-like woodwind just had me thinking of Road To Perdition and how much I love that film. Yet underneath it all there is a very distinct flaw: the concept that American life and natural decency is king. The narrative is so busy with its nostalgic recreation of Norman Rockwell visuals and flag waving proud Americanism that it glosses over the fact that a lot of people in the 50’s/60’s carried on like utter monsters under the blanket of “protecting the country from communism.” One place this is perfectly highlighted is during a train scene and its call-back at the end of the film. Having served his role as defence so expertly, Donovan is commuting on the train when he notices how he is looked upon with derision by his fellow countrymen. Spurred by headlines, the country’s bloodlust for all-things-Russian is targeted entirely at the lawyer who basically did his job and got his client a thirty year sentence down from the death penalty. The audience, empathising with the main character, feels that look of disgust and with hindsight we all sneer back and mutter, “bloody ignorant ingrates.” Then, at the close of the film, Donovan is on the same train, only this time the headline portrays the lawyer as an American to be proud of and the lady inspecting him offers the slightest of smiles. Donovan returns the smile and the music swells as if to imply “all’s well that ends well.” No! Wrong! All that says to me is that people are fickle, stupid, misinformed sheep and if anything he should have either turned away repelled by her seesawing or delivered a menacing speech about hindsight tolerance. But I’m digressing here. The various performances are spectacularly subtle imbued with that folksy 1950’s “shucks I’m just a pilot/salesman/cop” kinda thing while displaying extreme flare for talking their way out of harm and conflict – again, something prevalent in 50’s cinema. But the further you stray from Donovan’s thread the more people become irrelevant and immaterial. Supports are wheeled on-and-off but no one arc is explored or followed very far. There’s a young assistant at Donovan’s firm who is dating Donovan’s daughter, after his introduction he’s never seen again, the life and times of the US student captured by the Stasi are glazed over completely and anything going on in East Germany fades the second it’s off-screen. In fact, there are so many interesting stories to tell but not nearly enough time to focus on any of them: the US prejudice of all things red, the division of Berlin, the power struggle between the DDR and USSR and the working lives of spies in the field, captured and disavowed by their own respective governments. There is, however, a nice parallel at play between the cold war mania and contemporary paranoia, transposing Russia for the Middle East but thanks to the level of hand-holding at work here, it’s probably lost on most audience members. As the film winds to its conclusion it’s hard not to feel a bit deflated. The finale is a touch middling, reflectively the conflict feels somewhat inflated from nothing and there’s the uncertainty of what actually happened. This is both brilliant and awful. Cinematically speaking, it’s a little frustrating, lacking the real drama and conflict of the cold war, despite being at the heart of the development, allowing audiences to join the dots without any real layering. But it’s also a brilliant analogy for the cold war itself. A lot of blustering, fear and confusion that amounted to very little in actuality. So, depending on how you view this film, either as a treatise of American and Soviet posturing or a spy fiction narrative, you’ll either enjoy it or come away feeling somewhat disappointed. Midway through the film, the story of Abel’s trial is put on hold and we are whisked to a Berlin which is in the process of being annexed off. Seeing the wall go up is a strange thing to behold, it’s an event that hasn’t really been explored on a film of this scale and, most annoyingly, it still hasn’t. What we glean is a fascinating look into an oppressive regime with a government who aren’t recognised as a sovereign power. On top of that, we learn that the Soviets are still punishing Germany by refusing them the ability to rebuild the city, forcing those trapped in the East to sift through the rubble while the West enjoys the luxuries of their American occupants. It’s a great snippet but I can’t help but feel there’s a whole film’s worth of stuff that has been excised in favour of the central story. Throughout the film there is a silent charm-off between Hanks and Rylance. Hanks, the champion of cinema, seemingly incapable of giving an unpleasing performance versus Rylance, the theatrical challenger, master of the boards and captivator of audiences. In truth, neither trumps the other but the two performances are so wonderfully complimentary that they become almost detrimental. Hanks is so delightful and Rylance is so calm that any sense of urgency is almost completely underplayed. The threat to Abel’s life is never really felt and with Donovan’s silver tongue working magic at home and abroad, there’s seemingly no obstacle that these men couldn’t best. 1. What is the name of the lead character in Alfie? 2. The rebel alliance and the galactic empire are factions in which franchise? 3. United 93 is set on which day? 4. What is the name of the body-swap film which starred Barbara Harris and Jodie Foster (then later Jamie Lee Curtis and Lindsay Lohan)? 5. Who played the lead role in 2004’s Finding Neverland? 6. John Travolta and Nicolas Cage famously appeared as one another in which film? 7. The Last Emperor is Bertolucci’s biopic about the last Emperor of which country? 8. Who directed Mallrats, Dogma and Chasing Amy? 9. Which actor has played Louis de Ponte du Lac, Tyler Durden, Achilles, Jesse James and Lt Aldo Raine? 10. Yul Brynner and Charlton Heston starred alongside each other in which Bible epic? 1. The Public Enemy was released in which year? 1929? 1931? 1933? 2. James Cagney won his only Oscar for which film? The Irish In Us? Yankee Doodle Dandy? Man Of A Thousand Faces? 3. How does Plunkett redeem the actions that caused the death of his squad members in The Fighting 69th? Going to prison? Covering a live grenade? Donating his pay to the affected families? 4. Cagney has only appeared in one Shakespearean adaptation. Which one? All’s Well That Ends Well? Henry IV Part 1? A Midsummer Night’s Dream? 5. Which of the following co-starred with Cagney in The Roaring Twenties? Tyrone Power? Claude Rains? Humphrey Bogart? 6. What is Bert Harris (Cagney’s character) job in Blonde Crazy? Newspaper reporter? Professional boxer? Hotel bellboy? 7. In which film did Cagney say, “Made it, Ma! Top of the world!” White Heat? Winner Take All? Captains Of The Clouds? 8. What is the name of Cagney’s character in Taxi!? Matt Nolan? Buck Gerard? Pop Riley? 9. What was the title of Cagney’s final release, 20 years after he officially retired and five years before his death? Ragtime? The Gallant Hours? Shake Hands With The Devil? 10. The three lead actors in Angels With Dirty Faces (James Cagney, Pat O’Brien and Humphrey Bogart) were all born in 1899. True or False? 1. What is the subtitle for Miss Congeniality 2? 2. The following is a quote from which film, “The purpose is to experience fear, fear in the face of death. To accept that fear and maintain control of oneself and one’s crew”? 3. How many Childs Play movies have been made to date (including the 2013 direct to DVD sequel Curse Of Chucky)? 4. Which film starred Willem Dafoe, Forest Whitaker, Johnny Depp and Charlie Sheen? 6. Sammy Jankis, Teddy Gammell and Leonard Shelby are characters in which Christopher Nolan film? 7. In which film does Jennifer Aniston play Joanna, a waitress in a restaurant called Chotchkie’s, where she is forced to wear pieces of flair as part of her uniform? 8. Who played the role of Juan Sanchez Villa-Lobos Ramirez in Highlander? 9. The following is the poster tagline for which 80s action film, “Soon the hunt will begin”? 10. How many feature films has David Fincher directed? 1. James Bond works for which agency? MI5? MI6? MI7? 2. What is the name of Charlie Baileygate’s schizophrenic personality in Me, Myself & Irene? Harvey? Hank? Hal? 3. To save money on The Fountain, what did Darren Aronofsky use instead of computer generated effects? Cell animation? Macrophotography? Stop-motion? 4. 2010’s Buried, starring Ryan Reynolds was shot in which country? Egypt? Panama? Spain? 5. What is the name of Lone Starr’s ship in Spaceballs? Osprey 7? Hawk 2? Eagle 5? 6. How long does Derek spend in prison in American History X? 6 months? 1 year? 3 years? 7. Who played the lead role in 1996’s Fargo? Frances McDormand? Holly Hunter? Jennifer Jason Leigh? 8. In Gran Torino, Clint Eastwood’s character is of which European descent? Polish? Irish? French? 9. Which of the following did not appear in Oliver Stone’s Wall Street? James Woods? James Spader? Martin Sheen? 10. The “any similarity to persons living or dead is purely coincidental” disclaimer that accompanies every film was introduced after a lawsuit with the man who killed Rasputin. True or False? Mockingjay: Part 2 picks up almost immediately where its predecessor left off; Katniss [Lawrence] is recovering from the wounds inflicted by the recently liberated (but still largely brainwashed) Peeta [Hutcherson] and is desperate to visit revenge upon President Snow [Sutherland]. Seeing Katniss as not only a rallying symbol but also a powerful political piece once the war is won, resistance leader Alma Coin [Julianne Moore] is hesitant to allow Katniss the frontline action she’s after. Instead, she is assigned to a propaganda unit. But once the group suffer heavy casualties while storming the Capitol, Katniss commandeers the squad and heads determinedly to her final battle. Oh and on the way she has to finally choose between Peeta and Gale – should anyone care about that particular plot thread. Having said that, you can probably just have a guess what happens to every character as from the very get-go any suspense that has been generated has been weighted with an unfortunate inevitability. I fully believe it’s not spoilery to say we know Katniss will end up with Peeta and we know she will win the day; that much is evident from the first film and anyone who thinks otherwise is deluding themselves. Furthermore, the entire series falters when it comes to the big picture. The first two films presented a narrow, ground-level point of view, which thrilled audiences because of the tense, overwhelming uncertainty of it all. Then the third and fourth films would step up and highlight the manipulative politics, resistance and world forging that comes with revolution. Only, everything that is attempted stumbles haphazardly and while we have an impression of the outline, we’re still left in the dark on a lot of matters. Admittedly, this is really one woman’s story and therefore makes sense that her struggle remain the centre focus but with so much to play for in this finely crafted universe, it’s hard not to feel a little disappointed with the overall, some would say lacklustre, conclusion. Stepping away from the negative for a moment, Mockingjay Part 2 flourishes in the same way the series always has. The visual effects and production design remain impressively high quality, with grounded CGI, practical effects and superb attention to detail. The superficial glamour of the Capitol and its citizens have been severely compromised but in its place the grubby conditions everyone is living under are no less impressive as far as the costume, hair and make-up departments are concerned. The music also continues to please but is never really given the opportunity to impress. James Newton Howard has been in command of the score for each instalment but his effort has significantly depreciated as the films progress. Sure, there are some wonderful standout moments and when things are at their most tense, his work shines through but ultimately the bulk of the music feels like flat filler. Much like the score, the acting also falls into a similar category of decent and dismissed. Nowhere is this more prevalent than the treatment of Peeta and Gale. On the one hand, Peeta (who was largely absent from the last release) is dealing with a barrage of mixed emotions stemming from being a POW, torture and lingering PTSD. And most impressively, Hutcherson (who I haven’t seen much promise in anything he’s featured in) handles it with maturity and credibility. Gale, however, is once again a pointless addition, who knows he’s second fiddle but never descends fully into villain territory, so he just exists and we see him existing and we don’t really care. It’s not that Hemsworth is doing a bad job either, it’s that he isn’t given any material to do a bad job with. And everyone else pretty much falls by the side of the road as Katniss fights on. New characters, old characters, the only individual who comes out with just as much acting stability is Donald Sutherland. That man has been appropriately menacing and malicious throughout and remains one of the only characters who has a satisfying denouement. The Hunger Games was a series that really stumbled into success. There was little to separate it from all the other young adult fiction adaptations but it quickly found an audience and grew in popularity. As such, it helped propel Jennifer Lawrence into stardom, was allowed to see itself through to the novel’s conclusion and brought a strong believable female protagonist to the screen. That last part is why I’m still annoyed by the romantic archetypal tropes of female characters. Looking back on the entire story, one of the weakest elements has been the love story and how it’s been dragged out hideously. It’s not that I don’t believe the central character’s conflict, it’s that I don’t think it was ever really necessary to the story. 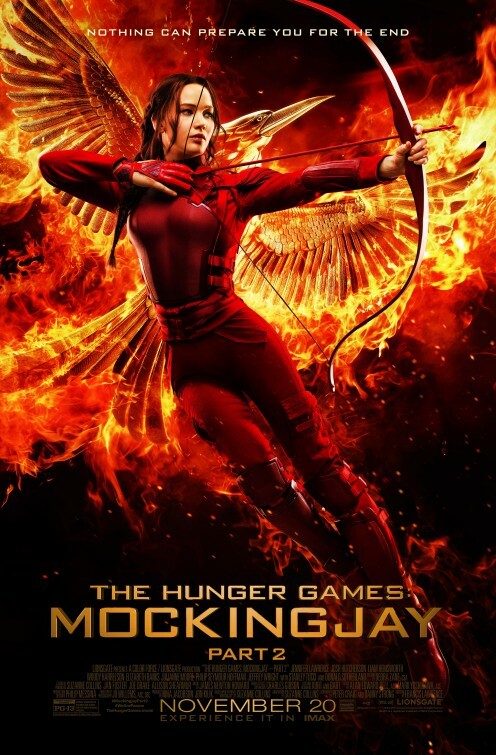 Harking back to the first film, Mockingjay Part 2 has a particular sequence that combines claustrophobic, drawn-out suspense with rewarding, fast-paced, frantic, immersive action. The scene in question takes place under the Capitol’s streets, where traps are few and far between. Snarling mutated creatures called Mutts (which I’m sure are explained in the book) are released and viciously set upon the group. Great direction, choreography, visual effects, audio work, editing, acting; a frankly captivating section of filmmaking. Either that or Katniss screaming at a defenceless cat. No matter how absurd or unrealistic the situation and in the face of endless speeches and whining, Jennifer Lawrence remarkably manages to sell the audience. To explain, actors are there to sell you a lie, the notion that what you are witnessing is real. If the actor is no good at their job, even the simplest of developments feel false. But if the actor has exceptional skill, they can make you believe absolutely anything. And I firmly believe one of the only reasons these films have scratched out any success, is thanks to Miss Lawrence. The story is divided into three acts, each set minutes before the launch of key products produced by Steve Jobs: Apple Macintosh (1984), NeXT (1988) and iMac (1998). Each time hop is prefaced with a little montage detailing how the computing world has moved on and how the titular character is viewed by the press and public. Each launch is fraught with chaos and hurried interactions before going on stage – the actual presentations themselves are almost irrelevant; it’s the life behind closed doors that we are treated to (specifically underappreciated colleagues, a neglected daughter and the concept of legacy). Jobs [Fassbender] seems solely concerned with the product and getting his message out there as healthily and successfully as possible. It’s evident from his manner, impatience and demands that he expects miracles from his staff and genuinely believes in his own egotistical mission statement. Trying to co-ordinate and filter everyone is Jobs’ right hand, Joanna Hoffman [Winslet], a genuinely pleasant patient woman who believes in her employer and acts as personal assistant, friend and consigliere. Watching this film, the first comparison that leaps to mind is Citizen Kane. Now, that probably means different things to different people. Many regard Kane to be the greatest film ever made and obviously I’m not drawing that particular conclusion with this release. What people may not be aware of is that Citizen Kane is effectively a loose biopic inspired by the image of newspaper magnate William Randolph Hearst. The names were changed and plenty of liberties were taken but in essence it was Hearst’s life as Orson Welles perceived it. Steve Jobs is the same; simultaneously a biopic and an entirely fictional work as perceived by Aaron Sorkin, only the names have remained the same. Much like The Social Network wasn’t really about Facebook (more the combination of monumental success at an early age and a crippling social disconnection) Steve Jobs isn’t really about its namesake or his products. The technical jargon and the real-life inspiration serve only as a platform for an entertaining work of speculative fiction. Subsequently this makes Steve Jobs tricky for some to review. Personally, I don’t like reviewing documentaries as separating the quality of the presentation of the subject matter from the subject matter itself is an unnecessarily demanding chore. With 2013’s Jobs, reviews were easy and largely damning. The content was simplistic and sappy, the performances were acceptable but none of the tone seemed accurate. 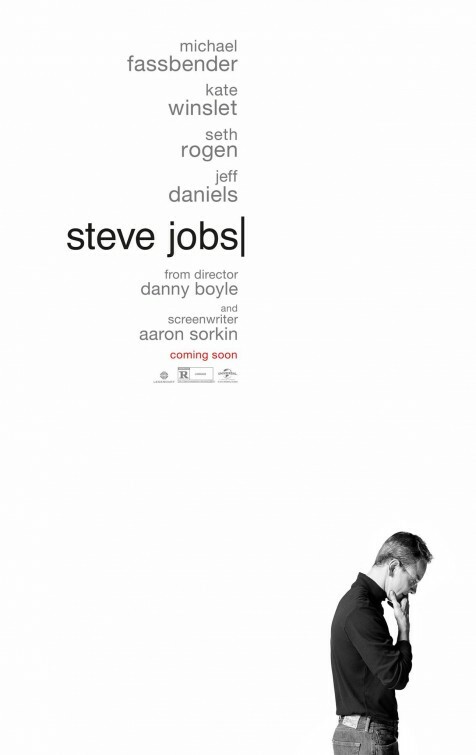 Boyle’s Steve Jobs, on the other hand, uses the source material as an excuse for flamboyant witty wordplay. Case in point, end to end service is still stupid but the film doesn’t really stand on the argument of whether Jobs was right or wrong with hindsight but his ability to manipulate the situation to what he needed, thereby giving a more powerful impression of the kind of man Jobs was, rather than some list of achievements. Boyle has a very diverse style; you’ll rarely see him do the same type of project twice. In truth this often means his films are without ego and presented to the fullest of their potential. The cinematography, direction and editing ensure that the pace is maintained brilliantly throughout and perform decently from start to finish, while Daniel Pemberton’s score is very serviceable; a nice underplayed mix of Reznor and Zimmer. Having said that, there are a lot of very on-the-nose visual references but that could entirely be because the script refuses to yield to anything but the dialogue. I certainly wouldn’t say this film is a character assassination but a very honest look at life off-stage, out of the public eye, inspecting the man under a very narrow microscope, giving an impression of a flawed individual. This unfortunately makes for a very blunt diagnosis; a lot of the mystery, supposition and ambiguity are robbed from both the narrative and the performances because of Sorkin’s style. His style being Sorkin has something to say and everything else is disposable. But it’s hard to slam Sorkin for too long, the dialogue, while completely spurious, is very engaging and entertaining, delivered with excellence by all involved. They may not be the words that were uttered but they certainly seem to represent the internal workings; like Hughes or Whedon’s razor sharp wit feeling so intrinsically pinpoint to how teenagers wish they could express themselves, while simultaneously being completely fantastical and removed from how they actually engage with one another. Several supporting cast members, such as Seth Rogen, Jeff Bridges, Michael Stuhlbarg and Katherine Waterston are wheeled out periodically to prompt Jobs into a frothing pool of intensity but don’t seem to add much. This is mostly due to the fact that they all seem to have the same drive and objectives, displaying Jobs fatigue and confronting him about his manner. This leaves the bulk of the work to fall on the two leads. The chemistry between Fassbender and Winslet is wonderful, full of power and energy and tension. These two individuals clearly rely upon each other whilst supporting each other completely. It’s an interesting portrayal of an interesting dynamic and one that thankfully sidesteps (almost completely) any form of sexual drive or involvement – as lesser scripts would have immediately leapt to. The film falters only when audience opinion is concerned. There are going to be those who see this as an enthralling, gripping representation and others who see it as little more than a fanciful unpleasant diatribe. As with its central focus, this film brings with it all the foibles, ego and traits of its creators many audience members will either love it or hate it accordingly. From a technical standpoint it is a very well accomplished film that happily runs parallel to the truth openly stating, “I don’t care what may or may not have happened, this is the better story” and cinematically speaking, the film benefits. Interestingly, this film ends better than The Social Network. Admittedly, The Social Network is a vastly superior film executed magnificently but it ends a little lacklustre, owing to the source material. This is not the case here. Steve Jobs concludes at the dawn of where the general public jumped on. The rock star launches, the technological leaps, the cult of Apple, Jobs’ philanthropy, for lack of better phrasing, we know how the story ends and that allows audiences to piece together their own perspective conclusions naturally. Personally, I’ll watch literally anything with Fassbender in, I find the man captivating. But at no point did I think Michael Fassbender looked anything like Steve Jobs. Not even in the slightest. I don’t think he particularly sounded like Steve Jobs either. But from what I understand, he acted like Steve Jobs and that, from a filmic point of view, is much more important. 1. Hotel Rwanda is set in which country? 2. How many James Bond films has Sam Mendes directed to date? 3. What is the name of the lead character in The Hobbit? 5. Armie Hammer and Johnny Depp starred in which 2013 western? 8. Which 90s film is about a weatherman who lives the same day over and over? 9. Merida’s outfits in Brave are all variations of which colour? 10. Who voiced the title role in the Stuart Little films? 1. What do Croker and his gang steal in The Italian Job? Gold? Paintings? A list of every undercover MI6 agent? 2. What is the name of the ice planet in Star Wars: The Empire Strikes Back? Hoth? Degobah? Yavin 4? 3. Which of the following did not appear in Inception? Eric Roberts? Tom Berenger? Pete Postlethwaite? 4. The following quote is from which film, “The next time you feel like showing off, don’t”? X-Men? X2? X-Men: The Last Stand? 5. The script for The Day The Earth Stood Still have strong references and metaphors to which religion? Buddhism? Christianity? Hinduism? 6. What is the name of the actor who played The Merovingian in The Matrix Reloaded? Nathaniel Lees? Lambert Wilson? Harold Perrineau? 7. Who was Zemeckis’ first choice to play the role of Doc Brown in Back To The Future? Dan Aykroyd? Richard Dreyfuss? John Lithgow? 8. Which of the synths is first to die in Blade Runner? Pris? Leon? Zhora? 9. Who composed the score for In Bruges? Dario Marianelli? Michael Kamen? Carter Burwell? 10. In Lock, Stock & Two Smoking Barrels, the scene in which Nick The Greek breaks the glass table wasn’t scripted. It was an accident that was left in then rewritten as a call-back later in the film. True or False? 1. Who appeared in Weird Science, Natural Born Killers, Richard III, The Avengers: Age Of Ultron? 2. At the start of Calvary, the unknown parishioner explains he will kill Father James on which day of the week? 3. Who directed and starred in the lead role in 1998’s The Horse Whisperer? 4. The following quote is from which film, “Why can’t you be happy for me and then go home and talk about me behind my back like a normal person?”? 5. What is the name of the 200 storey tower block in Dredd? 6. Lost In Translation was released in which year? 7. For the majority of the film, what colour is The Grand Budapest Hotel? 8. How many celebrities (excluding Emma Watson) are holed up in James Franco’s house in This Is The End? 9. How many films has actor Joseph Gordon Levitt directed? 10. The following is the poster tagline for which film, “Get the girl, defeat her evil exes, hit love where it hurts”? 1. Who played the lead roles in When A Man Loves A Woman? Andy Garcia & Meg Ryan? Billy Crystal & Diane Keaton? Matthew Broderick & Goldie Hawn? 2. Who plays the role of Louise Sawyer in Thelma & Louise? Susan Sarandon? Geena Davis? Jodie Foster? 3. Suffering with amnesia in The Muppets Take Manhattan, what alias does Kermit take? Phil? Fred? Floyd? 4. What did Barry Levinson direct in between Good Morning, Vietnam and Avalon? Bugsy? Rain Man? Disclosure? 5. The following quote is from which film, “You dirt-eating piece of slime, you scum-sucking pig, you son of a motherless goat”? The Man With Two Brains? Three Amigos? Roxanne? 6. In Perfume: The Story Of A Murderer, Jean-Baptiste Grenouille’s first victim is a girl who sells which type of fruit? Grapes? Plums? Cherries? 7. Who directed Straw Dogs, The Getaway and The Wild Bunch? Sidney Lumet? Robert Aldrich? Sam Peckinpah? 8. At the start of MASH, two Captains arrive at the Mobile Army Surgical Hospital. What are their names? Ripcord & Flint? Clutch & Roadblock? Duke & Hawkeye? 9. Which of the following Studio Ghibli films was not directed by Hayao Miyazaki? Princess Mononoke? Laputa: Castle In The Sky? Pom Poko? 10. American Splendor featured Josh Hutcherson, Anton Yelchin, Dave Franco and Miles Teller in early roles as kids dressed as Superman, Batman, Robin and Green Lantern. True or False?